Hooded coat constructed from a woolen blanket, in the style of a 19th century frock coat. The cuffs and hood are of black woolen cloth. Edges of coat, including cuffs and hood, are trimmed with a narrow strip of red woolen cloth (llama braid). Two decorative rosettes of red llama braid have been attached to the centre back area. See other examples of protective wear - enter 'clothing' or 'costumes' in the search box to your left. What famous author is shown wearing a capote in an HBC calendar painting? You might want to wear a sash with this capote. Check the Beaver Index - e.g., the premier issue of The Beaver, October 1920. The Beaver magazine was created as part of the HBC's 250th anniversary celebrations. This capote was made expressly for celebrations that occurred in connection with the Company’s 250th anniversary in 1920. 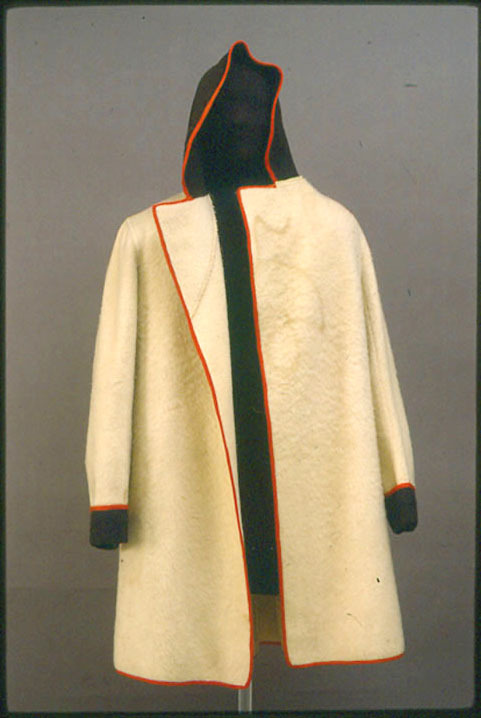 The term capote was originally used for a number of coats but over time came to be identified with the hooded blanket wrap coat used by European fur traders and Aboriginal traders. These coats were warm, durable, practical and easy to cut and sew. Both the North West Company and the Hudson’s Bay Company traded capotes. White blanket capotes were often favoured for winter wear because it served the hunter as a camouflage against the snow. The capotes were often worn in combination with white woolen blanket cloth leggings that were fastened to the leg with a decorative garter. The leggings covered the leg area from just above the knee down to the ankle. The Métis men residing in the Red River area in present-day Manitoba are described in the historical records as wearing sky blue or dark blue capotes that were tied around the waist with a red sash.